1. Is “Hamilton” sold out? Yes, but only for now. At this point, there are no tickets left at the original prices of $78.50 to $188.50. But more should become available. There’s a limit of four tickets per households, and some households wound up buying more tickets than that. DPAC management is reviewing online purchases. After excess orders are canceled, those tickets should become available again for sale at regular face-value prices. 2. What if you bought tickets at the box office? It appears that just about everyone who went to DPAC Aug. 18, and got a wristband came away with tickets. 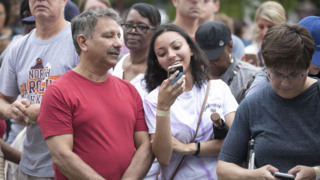 It even worked out for some of those who came to DPAC that Saturday morning to experience the buzz in person but intended to buy tickets online. That includes Deidre James, who had an online code but came to DPAC from her home in Greensboro just to be part of the scene. James said her online code didn’t work when she tried to buy online at the appointed hour. The experience left her “crying and frustrated,” she said in an email last month. But James found some helpful people who were in line for tickets at the DPAC box office and only planned to buy two. They offered to get two tickets for her, too. 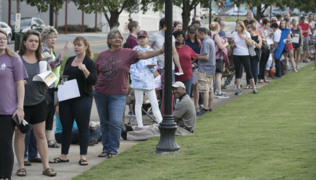 The Durham Performing Arts Center staff organized nearly a thousand Hamilton fans who lined up early for a wristband lottery and ticket sales on Saturday, August 18, 2018 in Durham, N.C.
3. What if you tried buying tickets online? James wasn’t the only person who struggled to get their Ticketmaster-issued codes to work for online “Hamilton” sales. There were widespread reports on social media of people who were shut out. 4. For everyone else, what about the secondary market? That’s where you can still buy “Hamilton” tickets right now, but at inflated prices. DPAC management emphasizes that the DPAC box office and ticketmaster.com are the only authorized places to buy tickets. If you buy them anywhere else, DPAC says it can’t “protect or guarantee your ticket seat will be accepted for entry,” according to the DPAC website. On Ticketmaster, verified “Hamilton” resale tickets for Durham are going for up to $2,000 for some shows. 5. Is all lost? How about the “Hamilton” lottery? No. A lucky handful of folks will get in super-cheap to each performance with the lottery. Details on the lottery will be released closer to the date, DPAC said. So maybe you’ll get in the room where it happens after all.